Our guests will see jewellery and interior objects created by famous Kaliningrad masters. "We are reviving the workshop brotherhood. We want that emblem of the guild would become a sort of high-quality mark. A buyer should be sure, that what he has in his hands is not a counterfeit, but the true Baltic amber", – tells leader of the Guild of Amber Masters Yuriy Velikotskiy. The guild was established in the end of 2015. The creative association includes high-profile jewellers and stone carvers: Konstantin Bushmelyov, Yuriy Velikotskiy, Mikhail Vorobyov, Lana Egorova, Alexander Korolyov, Nikolai Kotov, Pavel Litvinenko, Vladimir Litvinko, Vyacheslav Mishin, Alexander Sumerkin, Alexander Yuritsyn, Elena Tsvolko, Yuriy Chashchin. Each of them hat his or her own creative destiny and own manner, but they are united by the love for the Baltic gem and loyalty to the principles of work used by the masters from guild in the past. The guild members have taken part in more than 15 international, Russian and regional exhibitions. Among them are "Amber Trip" in Vilnius and "Amber of the Baltics" in Kaliningrad. 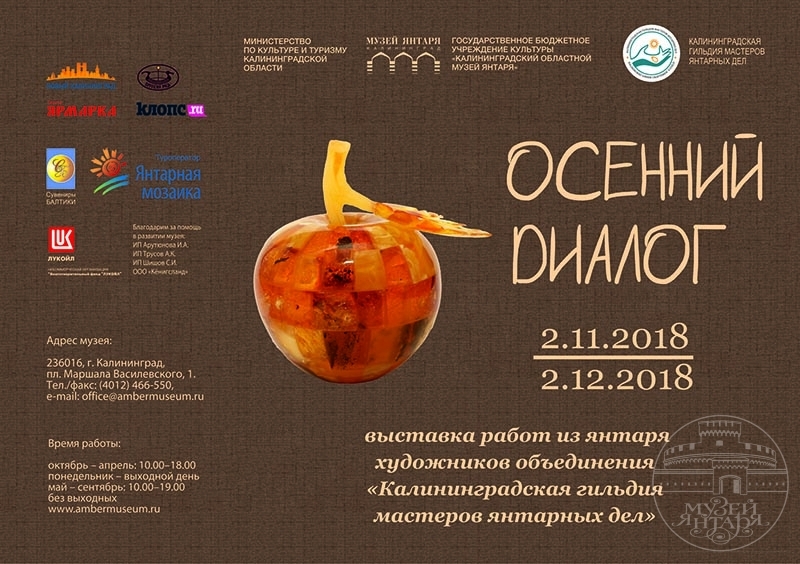 In the Kaliningrad Regional Amber Museum exhibitions that familiarise guests with the creative work of Kaliningrad amber artists have taking place for many years. They contribute to consolidate Kaliningrad oblast as the centre of jewellery and stone-carving art in Russia and the world, they promote Baltic amber as a unique artistic material. During the exhibition "Autumn Dialogue" educational events for our guests will be held.